Another April weekend, another birthday celebration for yours truly along with a side of crazy weather! The rest of Friday was spent decluttering our master bathroom and then it was off to pick up the kids from school to get the weekend started! I still hadn’t celebrated my birthday with my father-in-law, so he took us out to dinner at Carrabba’s – YUM! – and then back to his house for cookie cake and gifts. Friday was also super exciting because my beloved pink Hunter boots arrived in the mail!!!! And they are even prettier in person! If you read my post on Friday you will know just how excited I was about these because… Amazon sells Hunter Boots at a discount and I was able to get these for $35 off!!!! 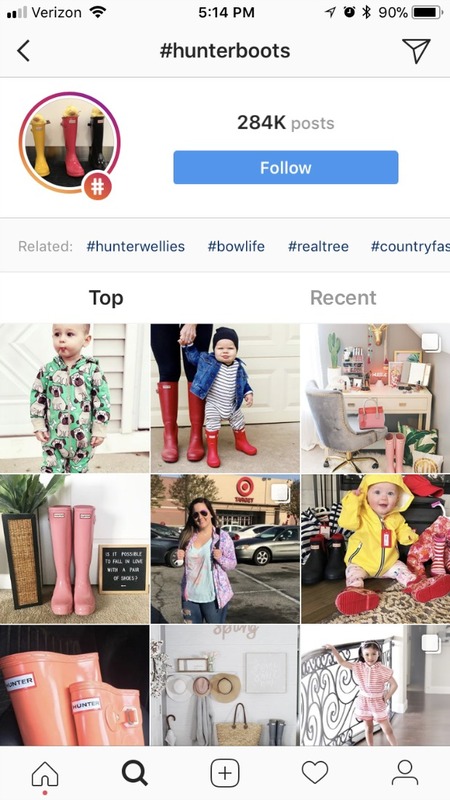 This weekend also happened to be the launch of Hunter Boots for Target so there was a lot of Instagram traffic for Hunter Boots, and this post that I posted on Instagram Friday evening ended up fourth in the Top Posts for the #HunterBoots hashtag. I don’t think that’s ever happened to me before, but it was crazy because my Instagram traffic spiked significantly. Saturday was GORGEOUS and we spent the morning cheering on our Boo at his soccer game. They were losing pretty bad in the beginning, but they ended up making a comeback and the final score ended up being 5-4. We lost, but it could have been so much worse considering how ugly the beginning of the game was! Saturday evening our baby-sitter, Mrs. Kristin (Jacob’s old 2-year old teacher) came over so B and I could head out to the school fundraiser for date night! As previously mentioned the theme was Casino Night, so we gambled the night away with fake money that was redeemed for tickets for door prizes at the end of the night. They had Blackjack tables as well as a Craps table, so after browsing the silent auction items and eating some dinner we grabbed our second drinks and settled in for an evening of Blackjack. My aunt and uncle were there as well as my other uncle and his girlfriend, so we all grabbed the same table and B and I taught them the rules for Blackjack as we all played. B and I used to go to Vegas every single year before we had kids (for eight years in a row) so we are very comfortable with table games in casinos. We played a LOT of Blackjack and Poker back in the day, so it was a blast to use our gambling skills again, even though we weren’t using real money. The whole evening made us both yearn for Vegas even more… I’m hoping we’ll be able to get out there soon! We took the kids to DQ for Blizzards and I have no earthly idea why because it was so flipping cold! Then the rest of the afternoon was spent inside at home just trying to keep warm. We had dinner at my parents’ house Sunday evening, as always, and it was a good ending to another wonderful weekend! Happy Monday, y’all! We’re back to sunshine and warmth! Well, kind of… it’s only supposed to get up to 63 today, but we’ll be back up to 76 tomorrow! Woo hoo! I hope you’re keeping warm wherever you are, too! It is April after all! 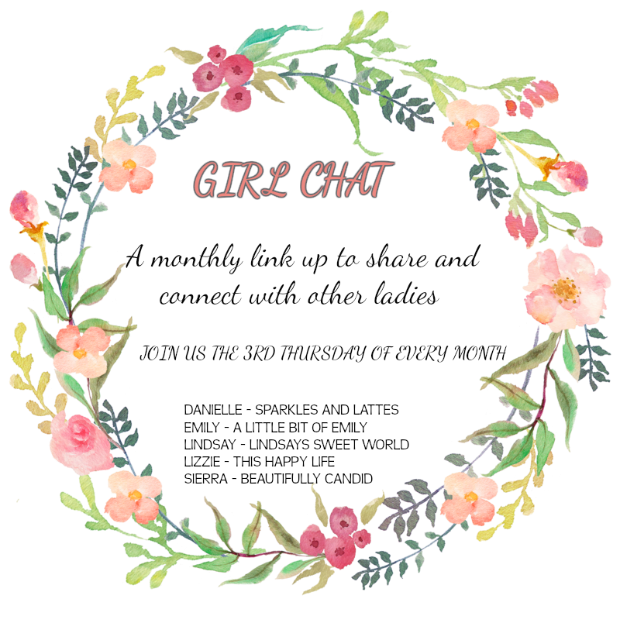 And a quick reminder before I go, if you're a blogger, don't forget to link up with us this Thursday for Girl Chat... we're talking about guilty pleasures this week! what a fun weekend! Those pink boots are darling! LOVE your boots! You are making me think I really should buy another pair, haha! The fundraising night always seems so fun. Nice you guys get a little taste of Vegas since you haven't been in so long! What a fun event Jacob's school!! And those Hunters, LOVE! The event at the school sounds like it was fun! I love your Friends shirt! What a fun weekend! I think I got the same boots as you for my birthday two weeks ago...haha! I shared them in my post today! I just saw them and they are soooo cute!! Don't you just love them?! I know!! That's the best way to go! Haha. Yes, it is possible to be in love with boots! So happy you got em. LOVE your casino night dress and dang it Mother Nature, make up your mind. It’s snowing here today, boo. That shirt!!!! THAT SHIRT!!!! I love it! OMG I'm loving your pink Hunter's!! & it looks like you guys had so much fun at the fundraiser! What a fun weekend!! Casino night is so fun! That is always Ben's works Winterfest Theme!! Love your boots~ I have a hot pink pair! This weather is drunk I tell you. I love your dress for Casino Night and that looks like such a fun event! The pink hunters are too cute, congrats on that post! have a great week. I'm sooooooo over cold weather! I feel like it has dragged on extra long this year. Love those Hunter boots!! It really does! I feel the same way and we live in the south! Your new Hunter boots are A.DOR.ABLE!!!!! I need some in my life! Looks like the fundraiser was a fun time. Happy Monday! I love your Friends T! I quote that show constantly. Thank you! I do, too! Best show of all time evah! Sounds like a busy and fun week ....I love my Hunter Boots and lately I've been getting a lot of use from them! Same here! We have had so much rain! You busy bees! I have so much I want to comment on! Love getting a glimpse into your weekend like this. :) Sounds so well rounded and FUN! Your t-shirt made me laugh - I may have to get one of those! Isn't that show just the best?! I quote it constantly. Probably almost every day. Haha. Love your boots! Talk to me more about the Girl Chat on Thursdays, how do I join? Thanks, girl! 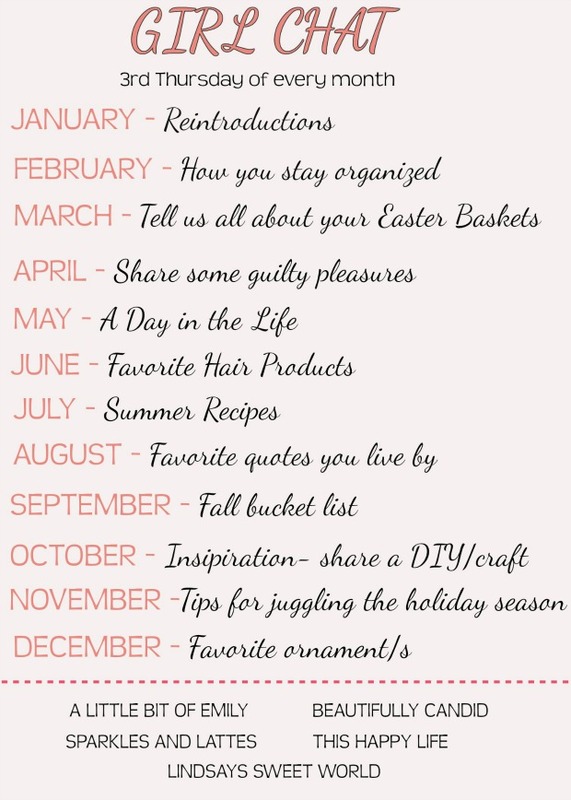 All you have to do is write a post about our topic (which is guilty pleasures this month) and then just put your blog link in the link-up with us on Thursday! Easy peasy! Fundraisers are always such fun and I love what you girls put together for it!